Dibrugarh (Assam) [India] Apr 13 (ANI): Cane and bamboo have remained inseparable parts of life in Assam. Grown in abundance, bamboo is the most essential natural resources and due to its exclusivity, the state has gained global recognition. The bamboo craft of Assam reflects the artistic mastery of the local craftsmen and people in Assam have traditionally been craftsmen since time immemorial. However, in a remote village of Assam’s Dibrugarh district, the local craftsmen are using organic methods to churn out the best quality bamboo products to make it easily available in the global market. 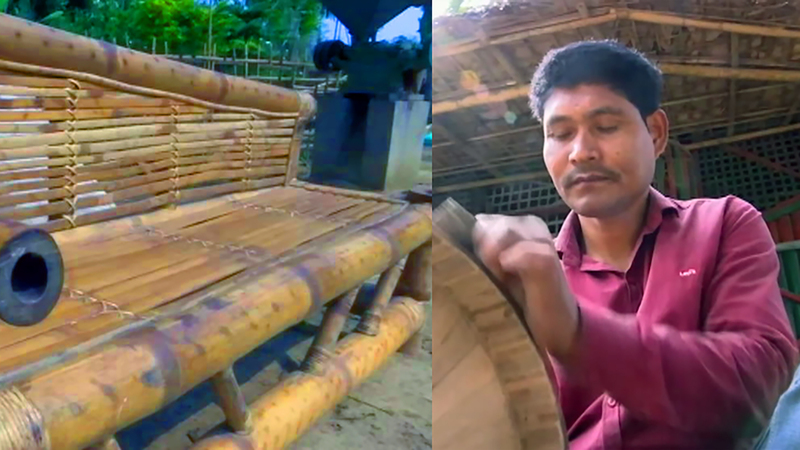 The craftsmen are using various organic methods including cow dung, other chemical-free alternatives to keep their bamboo-based furniture products durable and increase its longevity. "We sell to the market according to the order we get. Also, when people see our work on Facebook, they also place an order for our crafts," said bamboo craftsman, Bani Gogoi. Moreover, tremendous effort is involved in making and carving out of a bamboo craft from cutting to peeling of the raw bamboo material. The craftsmen are often seen making furniture items, decorative items, and other products of daily use with bamboo, that are more attractive and pocket-friendly. The organic approach of making bamboo crafts has, in fact, led to the increase in demand for the products in the market and has also received a positive response from some of the daily customers in the village. "The speciality of products here is that they keep the bamboo in a solution of cow dung and urine for a month. This ensures that the item doesn't get worms. The items coated with chemicals in the market, catch worms after a while; this doesn't," said, Montu Das, a customer. Bamboo arts and handicrafts, no doubt is one of the major sources of livelihood for the rural artisans of the state and hence modest support from the government and other private sectors can end the lack of infrastructural facilities, thereby increasing its productivity.